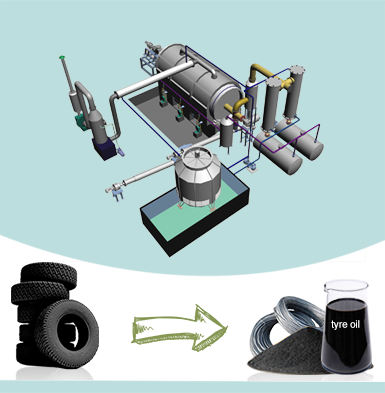 Beston tyre pyrolysis plant aims to solve the serious problems of black pollution currently. 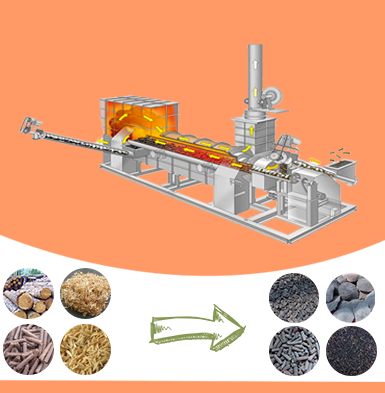 The waste pyrolysis machine is with world-class design and technology. It is not only good for the environment but also turns waste into useful products, such as fuel oil, carbon black, etc. So far we have successfully exported and installed our waste tire pyrolysis equipment in many countries, such as the UK, Indonesia, South Africa, Uzbekistan, Jordan, Brazil, etc. And we are looking forward to co-operating with more customers with the top products and service. Welcome to contact us! 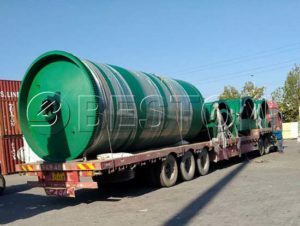 In order to maintain the profit of each client, Beston Machinery has designed two kinds of pyrolysis reactors with a unique operating structure. One is the furnace that can rotate in 360°, while the other one is the fixed furnace. Here are more details of our tyre pyrolysis machines for sale. Firstly, the rotary one requires small floor space and low cost. Besides, it rotates at 360° to heat uniformly to improve the pyrolysis efficiency. In addition, the uniform heating can extend the service life of the reactor to lower the investment costs. Finally, this kind of reactor has a simple structure and a strong adaptation. Hence, it is suitable for small-scale manufacturers. The fixed furnace can keep running for 24 hours, so it is also called as a fully continuous plant. The working efficiency is much higher. Moreover, this kind of furnace can support heat energy by itself to greatly reduce energy consumption and cost. Meanwhile, the continuous heating can speed up the pyrolysis process to get a higher oil yield. Thus, it can create higher profits for the client. Here are a table and a picture for your reference. As we can see from the table above, to invest in a waste tyre to oil plant is profitable. If you want to know more about the project, welcome to contact us now! The tyre pyrolysis plant has adopted the international newest heating structure, which is different from the traditional patterns, such as the direct fired heating (heating fast, but shorter service life of reactor), or the wind heating structure (longer service life of furnace, but slower heating speed). Beston waste pyrolysis machine has combined these advantages so that the machine has a longer service life. Meanwhile, it can largely increase the working efficiency and reduce the production cost. That’s why the tyre recycling plant cost from Beston Machinery is affordable and reasonable. Here is a waste tyre pyrolysis machine video for your reference. The machine has realized the international initial running form with a full range. Our tyre pyrolysis plant can be divided into three different patterns: batch tire pyrolysis machine (manual feeding), semi-continuous machine (automatic feeding, 2-3 furnace per day), fully continuous machine (working for 24 hours, fully automatic working pattern). Multiple designs of the machine can reduce the cost and increase working efficiency, and it can also resolve the difficult issues of the whole industry so that the entire industry has made a qualitative leap and realized the real sense of the marketization, industrialization operation. More importantly, we have rich experience and professional team to provide you with the most cost-effective tyre recycling plant business plan. The waste tyre pyrolysis machine designed by Beston Group has introduced the advanced PLC control system. In addition, our company also can provide the different PLC control systems with high, medium, low price according to the requirements of clients, so as to realize the thoroughly intelligent operation. By this method, it can not only make our tyre pyrolysis machine become more standardization and internationalization, but also can provide more choices for our clients. The whole equipment was equipped with the perfect discharge system, and the machine belongs to an eco-friendly project. 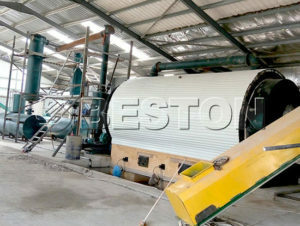 For example, the machine has been installed the tail gas burning machine, dedusting system to remove sulfur components. The discharge system has adopted the unique spay desusting system. The whole working process runs under the condition of no odors, no smoke, and it has a good security and environmental protection. The tyre pyrolysis system has used the advanced condenser system, which can further guarantee and increase the oil yield of the machine, and it is easier to maintaining and adjustment of the machine. Beston waste tire pyrolysis machine has been equipped with different professional catalysts according to the requirements of clients. The catalysts can purify the colour of the fuel oil, improve the quality of oil. In this case, the end products can create higher profits for the clients. 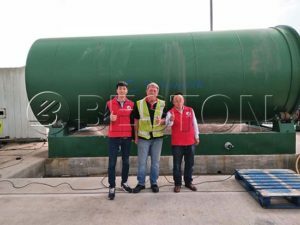 Beston Machinery, as one of the leading tyre pyrolysis plant manufactures in the world, has invented the newest pyrolysis plant with advanced technology and high quality. 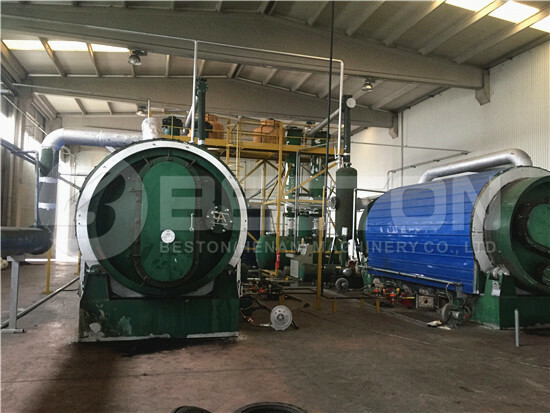 In addition to waste tyres, the waste pyrolysis machine supplied by Beston also can process waste plastic, rubber and oil sludge. Thus sometimes it also can be called the waste plastic and tyre pyrolysis plant. After sustained accumulation and improvement, our new-generation tyre recycling plant for sale has been released publicly. What’ more, with the outstanding production quality, good reputation, and almost perfect sales service, Beston Group has stood out from numerous waste tyre pyrolysis plant suppliers and kept a dominated status in the international market. 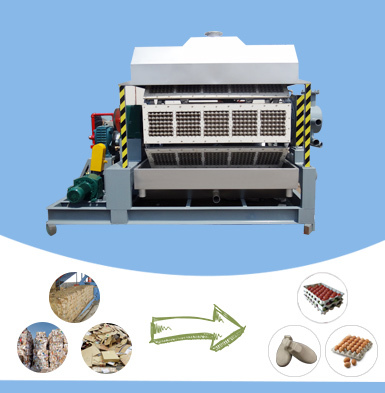 The waste pyrolysis process is a technology of thermophilic anaerobic treatment, and the whole process can be briefly introduced from four parts. At first, the pieces of waste tyres will be conveyed to the reactor for higher temperature pyrolysis through the sealed screw conveyor. Then there are oil gas and carbon black generating in the pyrolysis furnace with the increasing reactor’s temperature. Meanwhile, you can collect the carbon black directly. And the oil gas will rise under the function of air flow and enter the manifold. With the use of the manifold, we can separate heavy oil from the light gas. In order to extract higher quality fuel oil, our tyre pyrolysis plant has been equipped with a horizontal condenser system of higher quality and top technology. Therefore, the light gas will be thoroughly liquefied into fuel oil and collected directly by the oil tank. Moreover, we also developed a “three-in-one” condenser system, which is easy to install and land-saving. However, there is some combustible gas after processing by a hydroseal system. And we will reuse the combustible gas as heating energy to save your fuel costs. 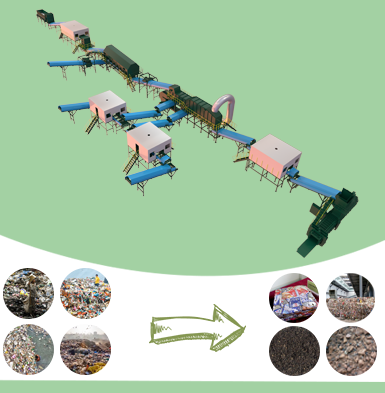 Therefore, the whole tyre recycling system is almost self-sufficient and eco-friendly. In order to ensure the product quality and working efficiency, the sizes of raw materials should be smaller than 50mm. Except for the high-quality tyre pyrolysis plant for sale, we can also provide a shredder if the diameter of the waste tyre is larger than 1200mm. When the temperature of the pyrolysis reactor is between 250℃ and 280℃, you will get the highest oil yield. In general, the highest temperature of the reactor is about 350℃. Each time, every operator should wear the fire protective clothing and fire protection gloves in case of the fire occurrence before discharging. In addition, please do not open the feeding port and slag outlet during the pyrolysis process. No matter what kind of plants you will run, including the waste plastic pyrolysis plant, the safety will go first. Beston can help you with equipment operation training. Fortunately, Beston waste tyre recycling plant is always under the fully-sealed condition to avoid explosion accidents. Except for top-quality waste pyrolysis machines for sale, we also offer service of product maintenance and updates. 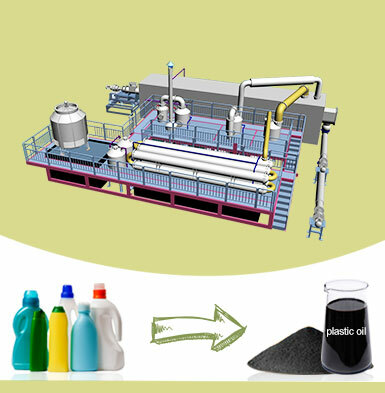 If you have any questions about waste tyre pyrolysis plant, welcome to contact us!